The 14th chapter in Gary Arant and Justin Gary�s Ascension saga will be Ascension: Deliverance, coming from Ultra Pro Entertainment and Stone Blade Entertainment in November. The storyline for Ascension: Deliverance picks up where the Delirium set leaves off (see "�Ascension: Delirium� Brings Dreams and Nightmares to Life"). Now, the people of Vigil struggle to seal off the portals to the Dreamscape as their world is overrun with madness. Players can use the new "Dreamseeker" cards to guide their band of heroes and constructs to defeat monsters in their quest for honor. During the game, they can use the powers of the new �Phantasm� cards without buying them and adding them to their deck, while "Dreambind Monsters" can be moved into a player�s deck after they are defeated in combat. 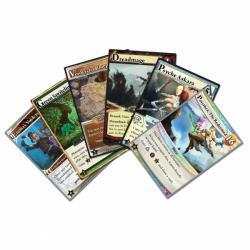 Deliverance also sees the return of �Transform� cards to the game. 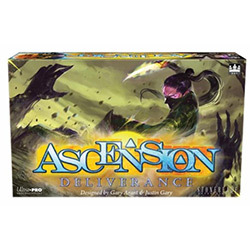 Ascension: Deliverance is a stand-alone game that can also be combined with other Ascension sets as an expansion. It comes with 212 cards, 1 game board, and 80 tokens. The game is intended for 2 to 4 players, ages 13 and up, and takes about half an hour to play. MSRP is $39.99.